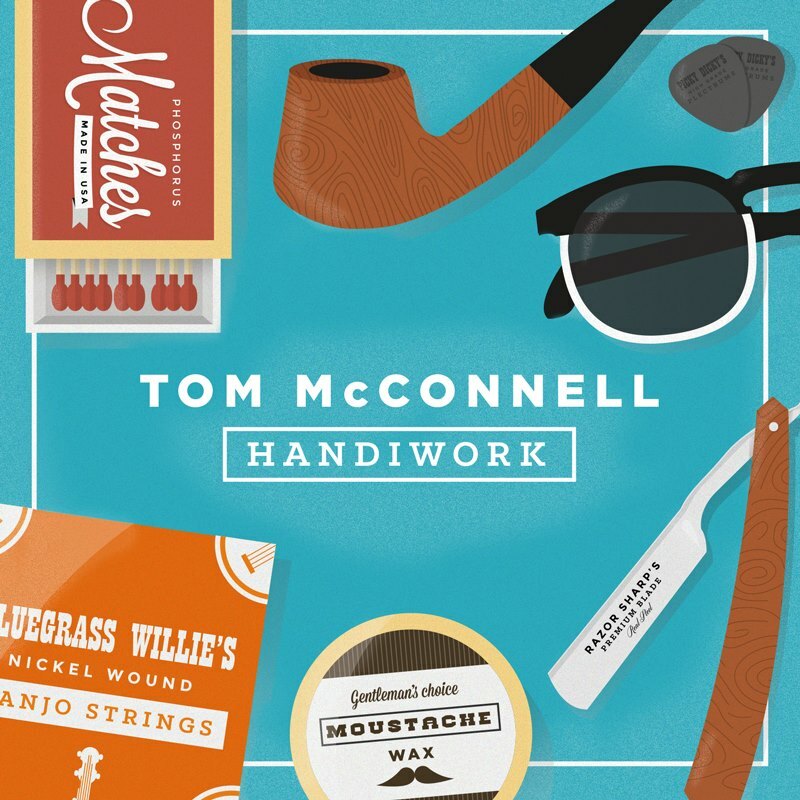 Self-described moustachioed Irish troubadour Tom McConnell released a new EP last week, named Handiwork – read our review of it here. 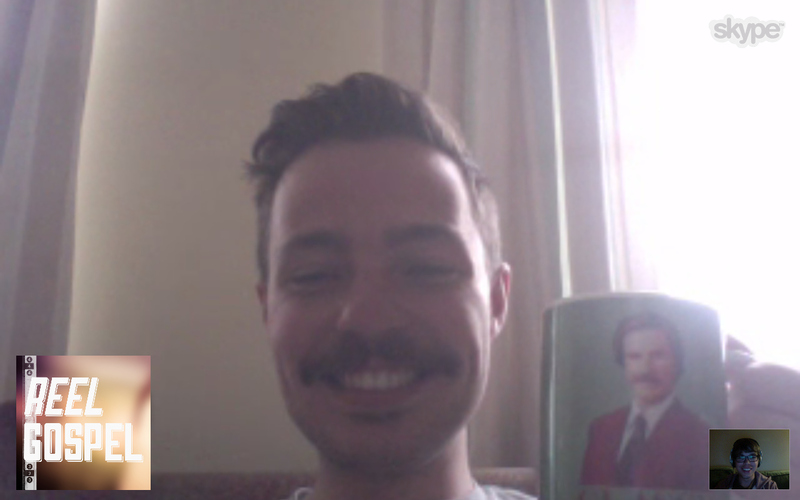 I caught up with Tom recently on an early UK morning, Ron Burgundy mug in hand, to talk about the Handiwork EP, the art of rewriting hymns, and that time Tom scrawled permanent marker all over his arms. SAM: Tom McConnell, where in the world do I find you today? TOM: Today I’m in Suffolk, which is the east of England. Not where I’m originally from though. My parents live here and I’m staying here for a little bit of time for some work-related stuff. But I’m originally from Northern Ireland via Edinburgh and I’ve spent some time in Seattle as well. So I’m kind of a troubadour, a wandering nomad. SAM: I’ll ask you about that in a second, about how you’ve travelled the world, but before that, can you tell me a little bit about who you are and what you do? TOM: Yeah! So I’m a full-time musician at the minute. I travel around playing and that’s a pretty fluid programme. I play all sorts of things like the bar circuit and I’ve also been leading worship in churches. To be honest, those things tend to be one and the same because I’ll end up playing the same kind of repertoire… It’s adjusted but I’ll end up playing a lot of my gospel-influenced songs in the bars and I would be playing the same songs to lead worship on a Sunday. It’s really cool that I have an opportunity to do that. It gives me a lot of chances to travel around and see the world while I’m doing it. SAM: So how did you find yourself going from the UK to Seattle? And then back? TOM: So I ended up going to Seattle as part of a studying abroad programme with my university in Edinburgh. I kind of just had this list of cities that I couldn’t go to, and honestly it was like eenie meenie minie mo, I had no idea where I wanted to go. Didn’t actually know anything about Mars Hill before arriving in Seattle apart from my youth pastor in Ireland who had said ‘If you’re going to Seattle you should check this place out,’ but it was – Seattle was actually my second choice, I think Chicago was where I had my heart set on and then the application came back saying they were sending me to Seattle instead. So I spent a year studying there, but to be honest by the end of the year I wasn’t really going to any classes and I was spending pretty much all my time hanging out and making music with the guys in Mars Hill Church. That turned into a bit of a full-time affair over there. That was always going to be a one-year thing and then I came back to finish my degree in Edinburgh and since then I’ve gone full-time with touring and recording and collaborating songwriting as well. SAM: You did well to pack all that into a year. TOM: Yeah, I mean it was just an incredible opportunity that they gave me. It was definitely a good time because they were looking for guys to join a number of different bands, and so it was definitely God’s timing. I was coming in at the same time as Zach Bolen [from Citizens] was coming in and he was looking to form a band, so that worked really well. Yeah, I think they were looking for all the guys they could get during that year and so if they had one volunteer they were going to milk him for all that he was worth! SAM: And you got to play guitar on Citizens’ album which is great. TOM: Yeah, yeah. That was a lot of fun. Probably the most fun about that – I was speaking to a guy yesterday in London and we were chatting a little bit about Citizens and he was asking me what the most fun part of that process was in terms of the album. It was definitely recording some guitar and I had this pedalboard that had thirty different pedals on it. I hadn’t a clue what I was doing with it really. But [producer] Brian Eichelberger, he was just saying ‘Tom, just play some stuff and I’ll mess around with your feet down here…’ So I was just noodling away and Brian is completely making my noodles sound like the most epic riffs you’ve ever heard! SAM: So was he stomping while you were playing? SAM: Now you describe yourself as a Moustachioed Irish Troubadour. We’ve covered the troubadour thing, obviously you’re Irish, what about the moustache? Why the moustache? TOM: That’s a good question. I don’t know! I think it all started when I was in Seattle and they were having a moustache-themed party in my house. So we all had two weeks to grow a moustache. Then in two weeks, my beard was kinda patchy but the moustache came through quite nicely. Then I actually won the award for best moustache at the party. So I thought I’d roll with it for a bit and I’ve never looked back. SAM: Wow. Nice. And there are a lot of beards in the Christian music scene at the moment… Maybe it’s time to claim the moustache? TOM: That’s it. Yeah. I mean, you do take a lot of schtick from everybody… I mean just last night somebody was asking me if I was a member of the Village People. So there’s that. And people ask you if you’re doing a Tom Selleck or a Magnum PI impression or something. SAM: You’re just ahead of the trend! Now we’ve talked about your title. I’m keen to know more about this musical style you’ve classified as ‘Fo-town’. What is fo-town? TOM: Well it’s kind of a marriage of folk and motown almost. I suppose with everything leading up to this release, that was kind of what I’d branded myself as. But the Handiwork EP is much more… I guess it pushes more into the Americana-bluegrass style. I wouldn’t describe it necessarily as fo-town. I’d been branding myself as that up until this point but the reason that this EP isn’t like that is because the guy whose house I recorded it in is going through a total country music phase. He’s like, ‘Tom, if you’re going to record in my house, bring your banjo and we’re going to record some country songs,’ and I was like, ‘That works, we can do that.’ So fo-town is maybe something that I’m putting to bed for a little while. SAM: Well, a man of many different styles, obviously. Let’s talk about the Handiwork EP. How long has it been in the pipeline for? TOM: Yeah. So all of these songs have been written this year. The first one that was recorded was Old Hymns/New Hearts back in January. That was initially just a B-side for another single that I put out back in February which – the single I put out in February was just a pop song. It didn’t have any depth, it was just a love song to be honest. It didn’t have a gospel influence or major deep themes in it. But I wrote Old Hymns as a B-side and then it turned out that Old Hymns got picked up more than the single did. That in some ways was encouraging for me to see that folks wanted to hear a little bit about my faith. In my soul stuff I’d been wary of pushing my faith overtly through my music up until that point. And then I just thought, I’m just going to record a worship EP. Just an EP of songs that are unashamedly about the gospel and influenced by that. I felt like the opportunity was there to do that. So the rest of the songs, Handiwork and the arrangement of And Can It Be then fell into place in the following months. It’s been a project that’s been going over the last four months but it was really only the end of March, beginning of April when I thought we’re going to put out a four-track EP in June time. It’s been a process where I’ve recorded a song, see how it goes, and then I ended up with four songs after a couple of months. SAM: Well the first song, Handiwork, it’s celebratory. What can you tell me about the message of the song? TOM: The piece of Scripture it was inspired by is in Ephesians 2, particularly 2:10 where it says that we are the workmanship of God, created in Christ Jesus to do the works that he set out for us to do. I love this idea – in fact you can’t see it but right now I’m looking at a painting of a guy who is in a workshop and he’s slaving over something. I love this idea that as an artist and musician and I’m sure for you as a writer as well, we can all understand we have our crafts. The fact that God would put so much effort into us, the same way that we would into a sculpture or a painting or a piece of art or a piece of music. The effort and the detail and the labour of love that goes into that. I love that he has done that for us, but also that we serve a purpose. He has painstakingly made us but we’re also here to do something, and he’s set that purpose out for us. The song is a little bit about that idea, but the purpose is to build his kingdom here on earth. But that can be expressed in a million different ways. For me, it’s music. So that was my expression of that purpose, to write a song about it but it’s pointing people to the fact that God has given them a way to express his purpose for them as well. That’s a little bit of the heart behind that one. SAM: And how did the musical arrangement come together? There’s a lot of banjo! TOM: Yeah there’s a lot of banjo! Again, it was mostly because James who… Essentially the whole thing was recorded in my friend’s garage here in Suffolk and he basically was loving country music at the time, and asked me to write a hoedown that he could record. Honestly, that was the starting point for that: ‘I need to write something that sounds like a hoedown.’ I had this message in mind so that was the starting point. SAM: And you got creative on a shoestring budget and made a video clip with permanent markers, writing the lyrics all over yourself. SAM: I hope you weren’t going out for dinner that night. SAM: That is really ironic because that’s what you’d expect kids to come into an exam with. SAM: Did you manage to keep that job for very long? TOM: Yeah still got it! SAM: Now the next track, which you mentioned is the oldest song, Old Hymns/New Hearts, what’s the message behind this song? TOM: Essentially with that one, I wanted to write… It’s not that hymns have a formula but I guess I wanted to write something in that similar three-verse structure that we see in hymns that have been in the church for 150 or 200 years. What I wanted to do was write a song that was like a bite-sized gospel to explain from first verse until third verse just the journey of the gospel. Obviously you can’t cram it all into three verses but I wanted to try to explain it as best I could in that time. So the first verse is very much about what life is like with God and what it means to follow our own path – it’s saying my heart had gone astray and I was in despair, but then there’s this hope because in the second verse it talks about the sacrifice of Jesus and then what that means for us. Then the third verse is about the resurrection and the life that gives us and the fact that we’re made alive with him. So it was me trying to explain the gospel in a digestible way. Because… A lot of my music until this release has really been pushed on the bar circuit so the people it’s reaching are mostly folks – and here in England you’d be surprised how few Christians there are – so it’s me trying to present the gospel to them in a way that they might be receptive and responsive to. Trying to make the gospel accessible in one little three-minute nugget. SAM: If you’ve got the gifts for that, it’s fantastic that you’re using them in that way. TOM: Yeah that was the heart behind that one. It’s been amazing to hear from folks via email who have been saying that they have been introducing it in their churches. It’s really cool because when those stories come back it’s encouraging to hear that, but what’s even better is that there’s probably a hundred stories that I haven’t heard. I hope God’s using this song to glorify him, and I won’t hear those stories because it’s not about bringing the glory back to me, it’s about him receiving the glory for that song. That’s exciting. SAM: The front cover of the EP contains an assortment of illustrated items. Can you tell me more about them? Is there a hidden message to it? TOM: That came about because with my previous EP that came out nine months ago, I was doing a launch gig up in Edinburgh and then I had some friends come along and play at that. One of my friends who opened the night for us is a graphic designer. He was just like, ‘Do you want me to do up a little poster for the gig?’ So he drew up the poster and used all those different illustrations. Essentially the EP cover is a rearrangement of the poster he did for that gig. So there’s not really any hidden message behind it other than these illustrations evoke slightly whimsical things that maybe reflect the whimsical sounds you will hear on the EP, I guess. Whimsy is how I would describe it with the banjo and the rest of it – it does reflect the sound. SAM: And the moustache wax! TOM: That’s true. Actually I don’t have any of my own. I need to get some. It’s quite difficult to curl a moustache up. You need to really train it to do that. If I put any wax in it, it falls straight back down again. SAM: Moving on to something different… The arrangement you’ve done on And Can It Be. It’s quite different to the traditional music. How did you go about making it your own? TOM: I guess the idea of taking a hymn and rewriting it probably came from my time at Mars Hill, initially. That’s something that they have been really great at. The first Citizens EP that came out was pretty much all, apart from the last song, hymn rewrites. I just love the fact that there are these texts that are so rich and so gospel-centred and edifying and exegetical in a lot of ways as well. We do use them in church but they kind-of have lost their impact because of how music has developed. Even the fact that with that Wesley hymn, the tune modulates to the dominant – the fifth – halfway through. That’s something that you don’t hear in anything now. Even with the text, that’s timeless, but the melody doesn’t make sense because of how we sing and how we write melodies these days. I guess I wanted to make that text slightly more accessible to a younger audience because people are growing up with it in the church, people have gotten used to it, but it’s still… the melody is kind of awkward in some places, leaps up and down. I wanted to simplify it a little and make it flow a little bit more. It took me ages to come up with an arrangement that I wanted to record because I think I’d been working on that one for the longest, maybe two months. SAM: That’s good! Were they your drums? TOM: Actually they were a friend’s drums. But it’s OK because his band is kind of Paramore style. They beat the life out of those drums anyway. SAM: All good then. No broken friendships over this record. TOM: No, no. He enjoyed it more than I did because we set-up two drums and we hit both. But he was going nuts on them. SAM: Now there’s only four tracks on this EP and for me, I wanted more! Is there some kind of message that links the songs? Or do they just sit on their own? TOM: Hmmm. Good question. I think I put them in the order I did because of how they flowed musically. There’s not really a lyrical theme. I guess with each each one of them, at least the first three, I just tried to write songs about where I was at. I guess lyrically they’re a little bit higgledy-piggledy because you’ve got one that describes God’s purpose in our lives, and you’ve got one which is about a journey from being lost to walking with the Lord, and you’ve got conversion hymns. Those don’t really go in chronological order I guess. So there’s not really a theme other than this all-encompassing idea of handiwork and the idea that these four songs describe where I’m at right now. It’s a fulfilment of what I feel God’s purpose for me in this season is, which was to release an EP that has songs that could bless people and songs that would glorify Him. The final song, The Wedding Song, was written as a wedding present for my friend. It could be retitled The Wedding Present because it’s my prayer that their marriage would be blessed and Christ-centred. There’s nothing really that ties them together! SAM: That final track, The Wedding Song, is such a sweet song. I was wondering if that might have been the story behind it. TOM: Yeah, we recorded Old Hymns first but then The Wedding Song was the second one that came about because I really wanted to record this present for my friend who was getting married in Seattle and I couldn’t get out to be at the wedding. Then after that we realised we had two songs – we could definitely throw another two together and get something out of it. SAM: You’ve released now a run of EPs, are we going to hear a full-length album from you sometime soon? TOM: I would love that to happen, yeah. It’s just a case of… it’ll be a little while. I don’t think it’s going to happen this year but I would love to get something out next year like a full-length. So to be honest, I think the way independent musicians can work by releasing little nuggets is an easier way to do it. If I was able to devote a couple of months and get the resources together to do a full-length album I’d love to do that. But probably the likelihood is that I’ll get another EP out before the full-length album comes out, I would say. So if that happens, I would encourage people to listen to all three EPs and then you’ve pretty much got an album there! SAM: Exactly! Thanks so much for the chat, Tom! TOM: Thank you very much! Handiwork by Tom McConnell is available now on iTunes. Read our review of it here. Posted in MusicTagged christian, Handiwork, Interview, Tom McConnellBookmark the permalink.